The doctors at this established medical centre are experienced in managing a broad range of health problems affecting all age groups. They aim to provide the highest standard of patient care whilst being committed to long-term servicing of all patients. GPs working at the clinic have a diverse special interests including family medicine, child health, women's health, men's health, minor surgery and family planning With practice nurses to assist with health assessments, care plans and vaccinations the doctors work efficiently, maximise the time spent with patients and can offer a consistently high quality of care. Open 5 days a week, the hours are from 9am to 5.30pm Monday, 8.30am to 5.30pm Tuesday, 8.30am to 1pm Wednesday, 8.30am to 5.30pm Thursday, and 8.30am to 1pm on Friday. This is a two doctor practice and provides the opportunity to work additional sessions at the main branch practice which is located a ten minute drive away. Doctors can also opt to provide additional paid services to the community hospital facility admitting their acute patients for treatment. The hospital also has a 4 Palliative care beds unit to provide end of life care within the patient’s own community. Tasmania is a modern, vibrant and unique place to live. Australia's only island state offers a tempting alternative to life in a big city without losing the big city perks. On offer is some of the best schools in rural Australia, affordable housing and you can say goodbye to traffic jams. 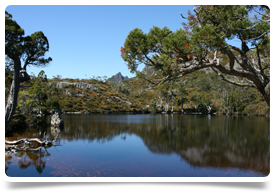 Tasmania claims to have the cleanest air and freshest water in the southern hemisphere; it certainly takes its green credentials seriously!